A coast-guard helicopter and navy divers scoured the frigid North Sea on Friday for signs of five crewmen, including a 15-year-old boy, missing after their Norwegian oil-rig support vessel capsized off northern Scotland. Three people were confirmed dead after Thursday's accident, the coast guard said. 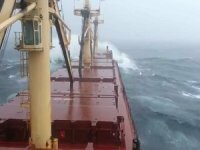 Seven other crew members were rescued and were being treated at a hospital in the Shetland Islands. 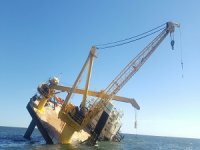 The Bourbon Dolphin capsized in calm seas west of the islands, off Scotland's northern tip, while performing a routine anchor-handling operation on a rig. British officials said all the crew members were Norwegian, although media in Denmark reported that one was a Dane. A 15-year-old boy, aboard the vessel on a work-experience placement with his father, was among the missing. "One of our pupils is, unfortunately, missing," said Soelvi Lilleboe Remoey, principal of the Yttre Heroey school in Heroey, western Norway. She did not give the teenager's name. "Even though it is just a missing report, it is painful just the same. The uncertainty is hard to handle," she told Norway's NRK state radio. British coast guards said the five missing crew members may have been trapped in the hull of the upturned vessel, which was operating at the Transocean Rather rig when it capsized. Authorities said there was only a slim chance they had survived. Michael Coull, duty watch manager at Aberdeen Coastguard, said there might be an air pocket under the overturned vessel, "and if the remainder of the crew were in a watertight compartment, then there's a possibility that they could still be alive". "However, the chances are extremely slim and it's highly unlikely that that's the case," he said. Weather conditions worsened overnight, with moderate winds and fog moving in. 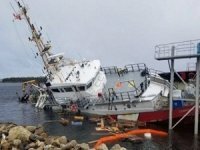 Jim Sinclair, watch manager at Shetland Coastguard, said navy divers were at the scene and preparing to search inside the upturned vessel, but that the search-and-rescue operation had become a search-and-recovery operation. 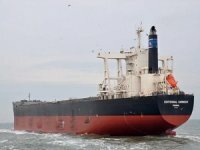 The ship capsized at about 5pm local time on Thursday and remained on the surface of the calm ocean in clear weather about 75 nautical miles west of the Shetland islands, coast-guard spokesperson Mark Clark said. 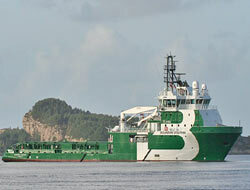 The ship is owned by Bourbon Offshore Norway AS. After the accident, 72 non-essential staff were evacuated from the oil rig, which is operated for Chevron by offshore drilling company Transocean. 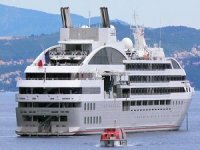 Bourbon Offshore Norway said it had chartered a plane to take relatives of the crew, along with Norwegian police, company officials and religious ministers, to Shetland on Friday. Norwegian authorities planned to set up a commission to investigate how the accident happened. The 72m Bourbon Dolphin was a new vessel, delivered in October, and was performing a routine operation in calm conditions. 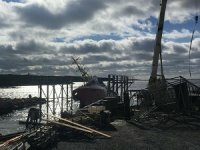 Bourbon Offshore Norway said the boat had not sent a distress signal before it capsized. Oystein Hovdkinn, Norway's consul general in Scotland, said the accident was "a terrible tragedy which is difficult to understand".